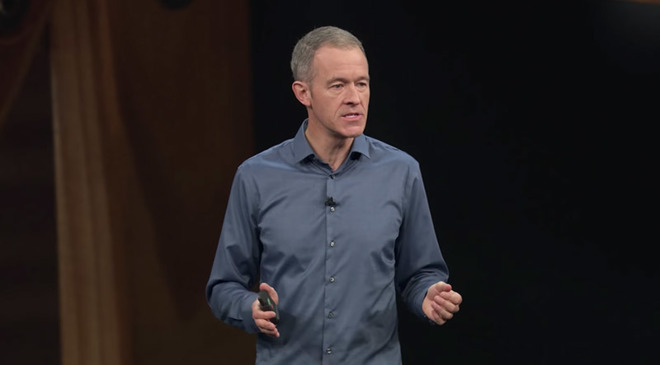 Apple's highest-ranking executives last week received batches of restricted stock units as part of the company's incentives plan, with many leadership positions netting more than $30 million each. Revealed in multiple U.S. Securities and Exchange Commission filings on Tuesday, the stock incentives were meted out in two transactions dated Sept. 30. General Counsel and SVP of Legal and Global Security Katherine Adams, retail chief Angela Ahrendts, CFO Luca Maestri and COO Jeff Williams each received 88,598 RSUs split into in two equal packages. The first batch of 44,299 RSUs are time-based awards scheduled to vest at three equal intervals over the next five years. The first vesting period lands on April 1, 2021, while the last is slated for April 1, 2023, dependent on continued employment at Apple. A second batch of 44,299 RSUs is performance based and requires Apple's relative total shareholder return to meet certain criteria between the first fiscal day of 2019 through the last day of 2021. Depending on performance, up to 200 percent of the RSUs will vest on Oct. 1, 2021. If company stock meets expectations, and the executives stay on at their respective current positions, the executives will gain 132,897 common stock units worth nearly $30.5 million at today's stock prices. In addition to the incentives, Senior Director of Corporate Accounting Chris Kondo received an award of 8,860 RSUs scheduled to vest at regular intervals over the next four years. Apple typically outperforms board-defined goals. In April, top Apple executives including Ahrendts, Maestri, Williams and other SVPs reaped nearly $22 million each in vested stock after the company landed in the top tier of firms listed on the S&P 500. Executives missed out on doubling performance-base RSUs in 2016, a year marked by lower-than-expected iPhone sales due to worldwide market contractions.